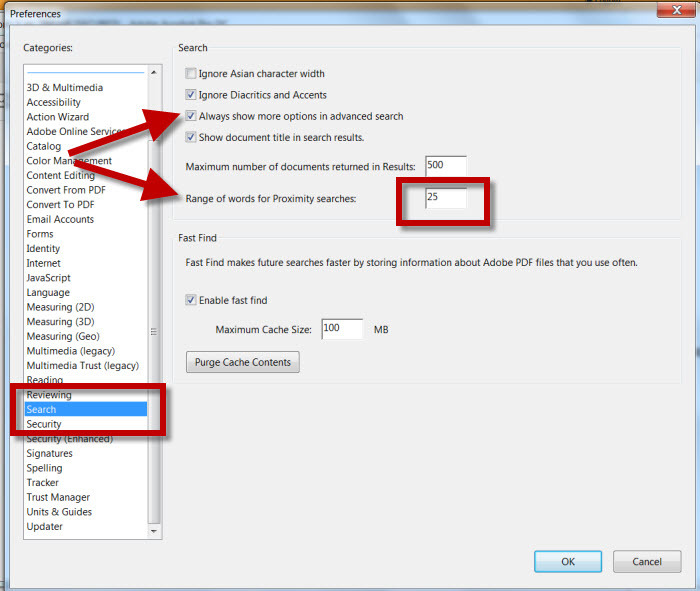 Users often don't know there are different setting they can use within Adobe that can affect their searching. This guide shows two things - preferences and searching - where using custom settings can help users. Adobe has the default range of words for proximity searches set for 900 words. That means that if users need a phrase retrieved (as opposed to a single word), searches within a downloaded PDF be frustrating and return a lot of partial results (one word or the other), but not what they are looking for - the actual phrase. A 900 word separation is often more than a page apart. For more precise searching, users will want the number closer to 25 - so within about a sentence. To reset the number, once you are in your Adobe reader, click on Edit, then go down to Preferences, and Click. Once the Preferences menu is open, select Search from the Categories in the left column. Then click OK in the bottom right of the box. 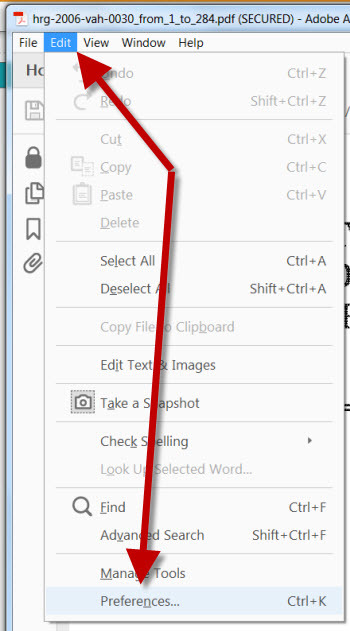 Once you need to find specific text within your PDF document, using Adobe, click the search (magnifying glass) and the Find menu will open. Click on the downward-facing triangle and click Open Full Acrobat Search. 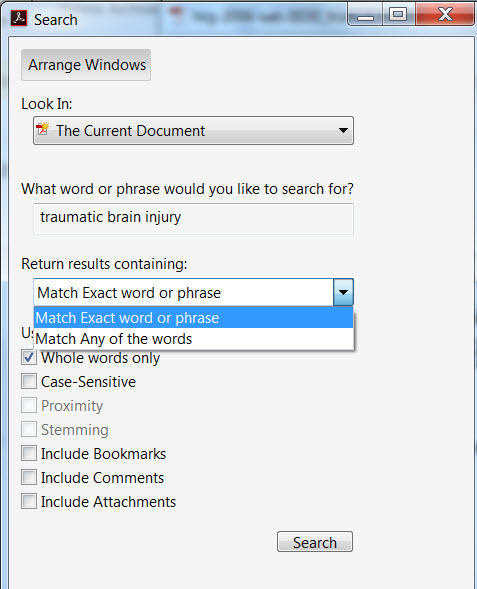 After the menu is open, users see more advanced search options including Match Exact word or phrase and Match Any of the words. Options in check boxes below that may be grayed out, depending in the choice made with the pulldown. Once the search word/phrase is in place, click Search. Search results for terms will show up in a box along the left. Mouse over the term to see the indicator of the page in the document (not shown). Note: if the document uses capitalization/formatting to show sections (as in the 3rd result here), it may be helpful to note in reviewing search results.